So first off, I’m going to go all English major on you for a second and talk about her use of the Southern Gothic genre and its tropes, because I just love it so much! 1. Southern Gothic and the use of Gothic tropes. I will begin by saying that Gothic and Southern Gothic are two of my favorite genres in classic literature, so of course I was lapping this up like a dehydrated dog in the summer time. If you don’t know, Gothic and Southern Gothic are the same yet slightly different. Gothic is represented in novels such asFrankenstein, Dracula, Jane Eyre, Wuthering Heights, etc; Southern Gothic is basically the American version of those novels. They both carry darker and more malicious themes, but there’s a draw and an enticing suspense provided for the reader, which is the overarching theme of Gothic tale. Martina Boone, used many Gothic/Southern Gothic tropes in her book, for which I was extremely grateful. She used tropes such as the decaying setting of Watson Island plantations, eccentric characters, the deterioration of southern aristocracy, darkness, superstition, madness and eerie, and of course a dash of witchcraft/occultism. These are all of your main tropes, and Boone used every single one of them, and it was seamless! You could tell she didn’t just use these tropes to fulfill the genre; she used them because it was a way of telling the story. And it was seamless in a way that brought a hint of magical realism to the book that I completely fell in love with. 2. Needless to say, this lady can write! On top of her excellent use of the Southern Gothic genre, she writes extremely well. Her imagery is beautiful, and you get sucked right in to the pictures she paints with words. I felt the eeriness of the forest and the darkness in the evenings, I smelled the scent of moisture in the southern air, and I could feel the odd texture of the Spanish moss dripping off the trees. I was completely enveloped by this book from start to finish. 3. A teenager who knows who she is. The main character, Barrie, is no stranger to loss and hardship. She is a character made of steel while still managing to balance on sky-high heels. I enjoyed the way Boone created her character. She was completely, 100% feminine with a love for shoes (which her godfather helped cultivate), and a sense of fashion that I don’t feel like you see in non-contemporary novels these days. Maybe it’s just the books that I read, but I don’t remember many characters that dress up instead of down. Barrie is also a character that is stubborn and knows what she wants. She isn’t easily swayed by Eight’s handsome face, or the warnings of her Aunt Pru. If Barrie has her mind set on something, she will do it. It may not be the right choice, or the safest, but she is a character who belongs to herself. She makes decisions for her own sake and she is the one who decides her fate. A character like this is hard to come by these days. 4. A true account of a small town. As a girl who grew up in the country just outside of a small town, I can attest that Boone’s account of a small town is 100% accurate. Everyone knows your name (and your grandparents’ name, and maybe even your great-great grandparents’ name), everyone can identify your truck -even if it is just because yours is the only one with a gun rack on the back, and yes, everyone knows when there’s a new girl in town. Believe me, all of this stuff spreads like wildfire and is completely accurate. Boone captures this so well that I secretly wonder if she actually is from a small southern town. I absolutely loved this book from cover to cover. The characters of Barrie and Eight were lovable, and I feel like readers can identify well with Barrie’s constant feeling of loss. This book touches on just how consuming a small town can be, and even more so for the towns that have magic lighting the rivers on fire and shadows lurking behind every corner. If you love anything remotely suspenseful, romantic, with just a dash of madness, this book is most definitely for you. My name is Jana, and I'm one of the debut author challenge hosts. Thanks so much for liking your review! 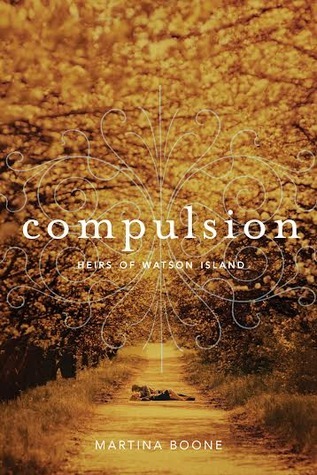 I had not heard of Compulsion before reading your review, but it sounds so good! I love Southern Gothic story lines and small towns. I think I need to go look into this one more! Oooh! I've wanted to read this one for a while, and now you've made me want it even more! I'm definitely adding it to my tbr. Definitely do that! I think it's an automatic download on edelweiss if I remember correctly! It's a wonderful and magical debut! IM SO HAPPY YOU LOVED THIS AS MUCH AS I DID AND WE ARE BOTH STREET TEAM MEMBERS AND AHHH COMPULSION!!!! I meant to ask you, did you finish Persuasion? I forgot to ask ya!